Brooklyn has been coming on strong at Surtex, the trade show for licensing and selling original art, for several years. This year, it seemed as though every third booth at the mid-May show and at the co-located National Stationery Show (NSS), had a sign up proclaiming a Brooklyn provenance. Granted, Surtex and NSS take place in New York City; Brooklyn is part of New York City, even if most people think NYC synonymous with Manhattan (full disclosure: I live in Brooklyn). And Williamsburg, a hip neighborhood in Brooklyn, is home to many artists, their studios and galleries. Add relatively cheap rents in nearby Industry City (still in Brooklyn). This is a cluster of large former industrial buildings with high ceilings, huge windows looking out on New York harbor (or the Gowanus Expressway on the even cheaper side), and heavy-duty floors. Here the streets are home to a host of adult video stores, a large cheap green grocer, Costco, and a MicroWarehouse. Artists, letter presses, and even some small manufacturers are inhabiting that group of buildings, which are being rehabilitated—and exhibiting at Surtex and NSS, which can feel like a local show until you note the letter presses and other exhibitors from Baton Rouge, LA; Minneapolis, MN; Worthington, OH, and elsewhere. Far elsewhere. Indeed, Brooklyn appears to be a mindset as much as a physical location. 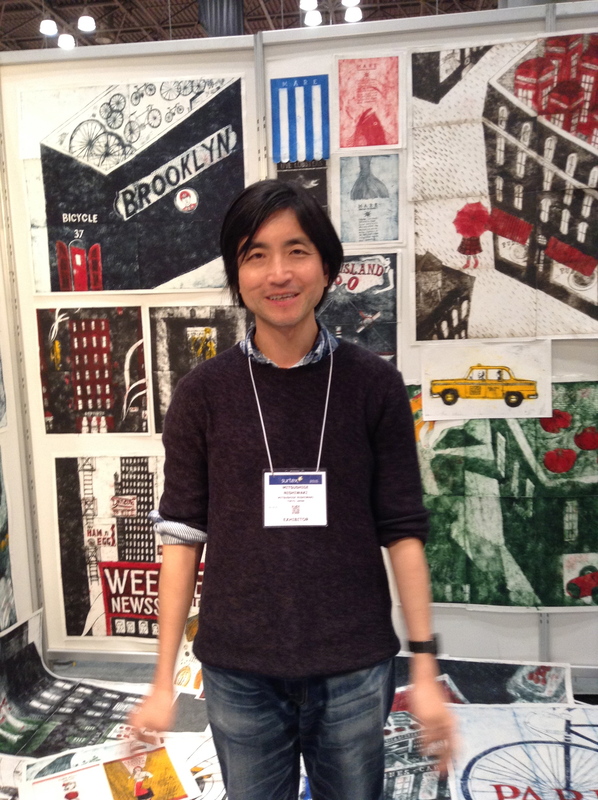 Looking at his work, I asked Mitsushige Nishiwaki, pictured here at Surtex, where he lived in Brooklyn. He laughed. “I live in Tokyo. I thought if I exhibit in New York, I need to have New York art.” His work is based on pictures he finds in magazines. He has several pieces about specialty donuts. “There’s a famous shop in Williamsburg,” he told me. “I add a little humor to the pictures.” His company is Etching Art Design; click here for his designs from Paris, London, Italy, and elsewhere. He’s had gallery shows in various cities including New York, and has a clothing licensee in France for a 2016 collection; I suspect there will be others. Holstee, a Stationery Show exhibitor, brings together a variety of trends in the art/artisanal sector: Based in Brooklyn; designing products with sustainability as a guiding principle; providing fair wage employment in third world locations. Prime example: The company’s Upcycled Wallet is “vegan” product (I admit I don’t know what that means other than that it’s not leather) that “provides the impoverished with fair wage employment while simultaneously reducing waste in Delhi.” Holstee’s City Leaf Map posters seem like a licensable design. One of the ironies of these two shows being co-located is that many of those at the Stationery Show, including Holstee, really are designers making or sourcing their own products and selling directly to retail or on their websites. Many could be licensing their designs over in the Surtex aisles, a notion which interests some but not others. For example, Graphic designer Cayla Ferari and engineer John Breznicky’s company LinePosters makes posters, glasses, t-shirts, and stationery based on Ferari’s line drawings of mass transit maps. They started selling wall decals based on a line version of the NYC subway map in 2011. They’ve added other cities, and some generic transportation-themed designs such as spoked bicycle wheels. Ferari says they like the control of making their own goods, including laser cutting coasters and doing their own printing. They have some specialty retail distribution and “for best selection” suggest their website. Other exhibitors are more opportunistic. 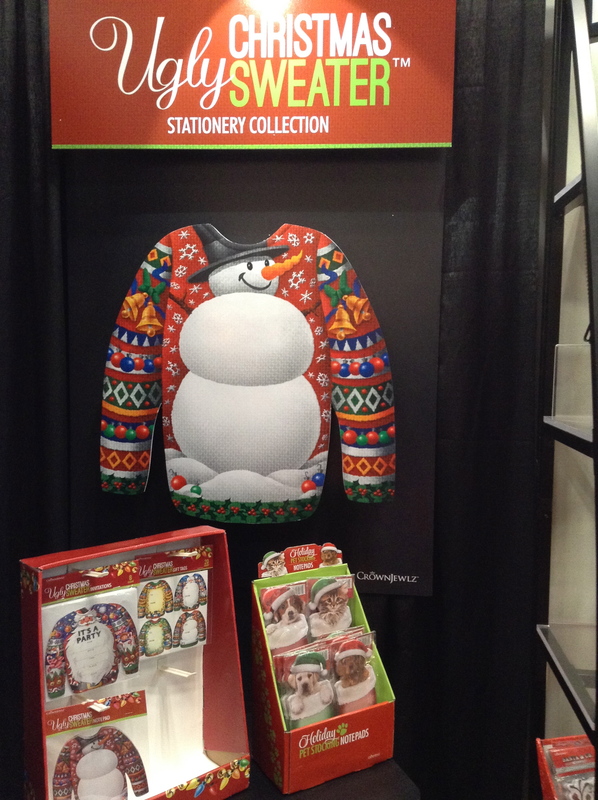 CrownJewlz, which offers a range of notepads, die-cut stickies, and other stationery items by a variety of more traditional artists, obtained a trademark for UglySweaters paper and stationery products (see photo at right). I’d expect to see a host of beyond-sweaters products this year, given the success of ugly sweaters last holiday season. Why not stationery? I’m surprised that Disney, Nick, Peanuts, and others with entertainment/character properties haven’t licensed the Pop-up Snow Globe Greetings cards made by Up With Paper (download the 2015 Everyday catalog to see examples, though this doesn’t do them justice; the effect is quite good). Or maybe they have in the past and I just haven’t seen it — the product has been around since 2005. It’s paper with a clear plastic globe that comes collapsed in an envelope. Monika Brandrup-Thomas is VP/Creative Director, based in Guilford, CT. Finally among the exhibitors that caught my eye: Berlin’s L.M. Kartenvertrieb & Verlags GmbH uses original designs by Juan Carlos Espejo to evoke images of Marilyn Monroe, Charlie Chaplin, Audrey Hepburn, Andy Warhol, and others for 3D bookmarks, rulers, door hangers, luggage tags, and other products.